My home was built in 2000, the year my 14-year old son was born. We have lived there since 2003. When I compare my house to many others I show and sell, I regularly come down with a case of house envy. I have learned that styles change about every 5 years and even a newer home can become dated in a hurry. When faced with this situation, how do you decide whether to remodel or sell? Here are some points to help with that very decision. This would include remodeling your own home or investing in a dated home and then remodeling. When the location is difficult to duplicate. In my case, I have panoramic views of all 3 ski resorts and the Olympic Park and we back to open space. When the floor plan makes sense. We love the vaulted ceilings and open floor plan of our home. Each child has their own bedroom and sink. They share a jack-and-jill bath. When you like the neighborhood and the neighbors. I enjoy retreating to Jeremy Ranch after working in town all day. It’s also an easy commute to the airport for my husband, a frequent flyer. We have a great homeowners’ association and wonderful neighbors. When the proposed remodeling upgrades make sense for the neighborhood. As a rule, you don’t want to have more money invested in your home than it would fetch if you suddenly needed to sell it and you don’t want to own the most expensive house in the neighborhood. Over time, we have changed most of the light and plumbing fixtures, upgraded the countertops, replaced most of the carpet, replaced the kitchen appliances, and painted many of the rooms in our home. We also gutted our master bath and added an outdoor deck and fireplace. This includes selling your home instead of remodeling or pass on purchasing a home that needs updating. When the location doesn’t make sense. Maybe you live on a hillside but really want a yard; perhaps your home backs to Highway 80 and the noise bothers you; or you are located outside Park City School District and have a 4-year old. In these circumstances, it may not make sense to invest money into a location that you don’t love. No amount of remodeling is going to change the location. When the amount of remodeling required will make the home too expensive for the neighborhood. If you need to move walls, the ceilings are low or the floor plan is too “choppy”, you are looking at big time expenses that could be difficult to recoup. If you are purchasing a home with deferred maintenance, get estimates to make sure the amount needed to bring the home up to snuff is in alignment with the purchase price. I encourage my clients to buy homes that need cosmetic updates. These are usually the least expensive improvements that are sure to increase a home’s value. Examples include new flooring, paint, countertops, appliances, and light fixtures. These improvements also have the most visual impact and allow buyers to customize a home in accordance with their taste and lifestyle. 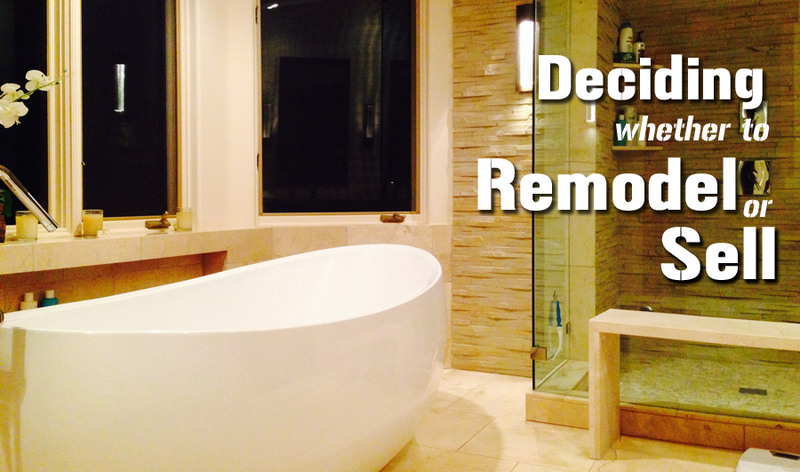 What are your thoughts or experiences with remodeling vs selling? Great article. Excellent advice. Thank you.